Hepatitis C virus (HCV) infection has an estimated prevalence of 3% in the world population and is still frequent among patients undergoing long-term dialysis all over the world. The Dialysis Outcomes and Practice Patterns Study (DOPPS) found that the frequency of patients with HCV in developed countries was 7.5% (5762 out of 76,689) (1). Patients with long-standing HCV infection are at risk for progression to cirrhosis and hepatocellular carcinoma. Recent evidence has been accumulated showing that chronic HCV infection can have serious consequences for several organs and systems other than the liver. The extrahepatic activity of chronic HCV could explain the relationship between HCV infection and the decline in kidney function in patients with CKD. A meta-analysis of longitudinal studies (n=9 studies; n=1,947,034 unique patients) demonstrated a relationship between anti-HCV positive serologic status and higher incidence of CKD in the general population; the summary estimate for adjusted hazard ratio with HCV was 1.43 (95% confidence interval [95% CI], 1.23 to 1.63; P<0.001), according to a random-effect model (2). In addition, interferon (IFN)-based regimens were able to reduce progression or incidence of CKD in diabetic and nondiabetic populations. Various hypotheses have been given to explain the kidney damage caused by HCV, such as subclinical immune complex deposition or accelerated atherosclerosis at kidney level induced by HCV (3). Also, chronic HCV could promote atherosclerosis through several direct or indirect biologic mechanisms (Figure 1). The relationship between chronic HCV and cardiovascular or kidney risk. HCV has been included in the group of nontraditional (but potentially modifiable) risk factors for death in patients undergoing maintenance dialysis. According to a meta-analysis of clinical studies (n=145,608 unique patients), anti-HCV seropositive status was an independent and significant risk factor for death in patients on long-term dialysis. The summary estimate for adjusted relative risk (all-cause mortality) was 1.35, with a 95% CI of 1.25 to 1.47 (P<0.01) in patients with anti-HCV seropositive status (4). The lower survival among patients with HCV who are on dialysis has been associated with various factors, including greater cardiovascular risk. Our updated stratified analysis on the effect of anti-HCV seropositive status on cardiovascular risk in the dialysis population showed that the adjusted hazard ratio for cardiovascular mortality was 1.21 (95% CI, 1.06 to 1.39) (P<0.01). This evidence was derived from four large surveys (n=91,916 unique patients). A solid link between HCV and an increased cardiovascular risk has been found in both patients with intact kidney function and patients on dialysis. 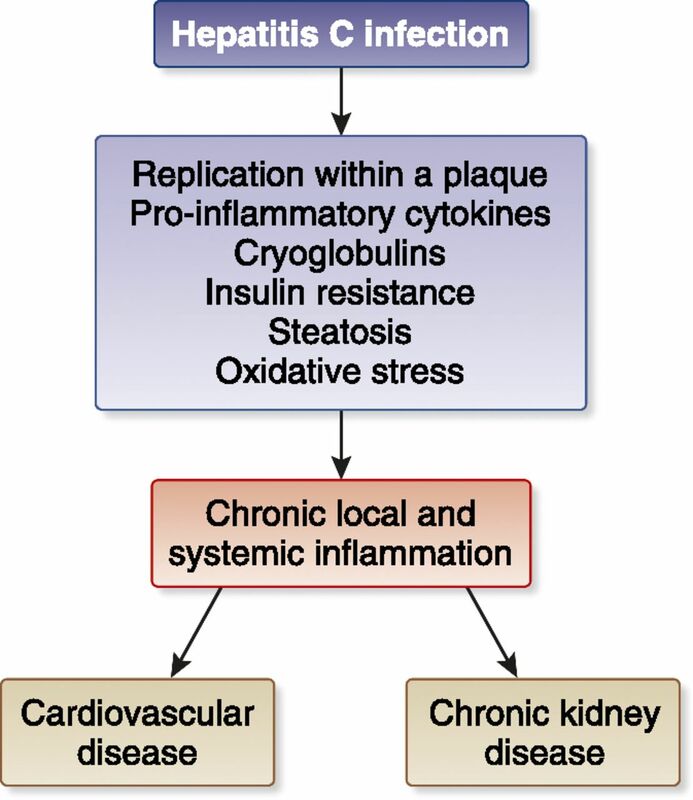 The higher cardiovascular risk in patients who are anti-HCV positive may stem from fatty liver disease and insulin resistance, contributing to a chronic and systemic inflammatory condition with endothelial dysfunction (Figure 1). In addition, insulin resistance and hepatic steatosis may contribute to the occurrence of other components of the metabolic syndrome, such as arterial hypertension and dyslipidemia. All these data call for the antiviral treatment of most patients who are anti-HCV positive with CKD, irrespective their liver fibrosis stage or candidacy for kidney transplant. Historically, HCV was treated with IFN and ribavirin therapies. Both are eliminated by the kidneys and require significant dose reduction in patients with impaired kidney function. IFN-based therapies have poor efficacy and a high adverse event rate in patients on dialysis; thus, the DOPPS reported that the number of patients on regular dialysis who are HCV-positive and received IFN-based therapies was extremely low (<5%). In addition, IFN-based therapies are associated with greater rates of allograft rejection after kidney transplant. The strategies for managing HCV have been revolutionized by the recent introduction of direct-acting antivirals (DAAs) that target specific nonstructural proteins of the virus and result in disruption of viral replication and infection. There are four classes of DAAs, defined by their mechanisms of action and therapeutic target: nonstructural proteins 3/4A (NS3/4A) protease inhibitors, NS5B nucleoside polymerase inhibitors, NS5B non-nucleoside polymerase inhibitors, and NS5A inhibitors. DAAs have turned HCV into a curable infection and this involves some difficult-to-treat patient groups such as patients with CKD, individuals with mixed cryoglobulinemic syndrome or advanced liver disease, and post-transplant recipients. Although patients with early stage CKD (eGFR≥30 ml/min per 1.73 m2) can be treated with any approved DAA-based regimen, there have only been three combination therapies that have been approved for patients with advanced CKD (eGFR<30 ml/min per 1.73 m2) and on dialysis. Hepatitis C: Study to Understand Renal Failure's Effect on Responses was the first study to assess safety and efficacy of DAAs in advanced CKD. It is a multicenter, phase 3, double-blind study (n=224 patients) including a randomized study of safety and an observational study of efficacy (patients with HCV genotype 1) (5). The all-oral, ribavirin-free combination of elbasvir (NS5A inhibitor) and grazoprevir (NS3/4A protease inhibitor), administered for 12 weeks, resulted in a sustained viral response in the combined immediate treatment group and intensive pharmacokinetic population of 99%. The frequencies of adverse events were comparable between the immediate treatment and deferred treatment groups (76% versus 84%). Another recommended treatment option that resulted in a high sustained viral response rate in patients with advanced kidney disease is the PrOD regimen (the combination of ritonavir-boosted paritaprevir, ombitasvir, and dasabuvir) administered for 12 weeks (patients with HCV genotype 1b). However, for patients with HCV genotype 1a infection, coadministration of PrOD with ribavirin is suggested for optimal treatment efficacy. The RUBY-1 study is a single-arm, multicenter study (n=20 patients) investigating the efficacy and safety of PrOD regimen with or without ribavirin in treatment-naïve HCV genotype 1–infected patients with stage 4 or 5 CKD, including those on hemodialysis (6). The sustained virologic response rate was 90% (18 out of 20). The EXPEDITION-4 trial is the most recent study evaluating the activity of DAAs in patients with severe kidney impairment. The EXPEDITION-4 trial is a multicenter, open-label, phase 3 trial including patients with compensated cirrhosis with or without prior treatment for HCV. It assessed the efficacy and safety of ribavirin-free, coformulated glecaprevir (NS3/4A protease inhibitor) and pibrentasvir (NS5A inhibitor) administered for 12 weeks in patients who had chronic HCV genotype 1–6 infection and stage 4 or 5 CKD (n=104 patients) (7). The sustained virologic response rate was 98% (102 out of 104) and serious adverse events were reported in 24% of the patients; none of the serious adverse events were considered to be drug-related by study investigators. Sofosbuvir, a nucleotide analog inhibitor of the HCV NS5B polymerase and the cornerstone of most current anti-HCV regimens, is eliminated by the kidneys and not approved for those with eGFR<30 ml/min per 1.73 m2. The significant and growing need to treat patients with HCV and advanced CKD has led some clinicians to administer sofosbuvir in patients with advanced CKD; the pooled sustained virological response 12 weeks after the cessation of antiviral treatment rate was 89% (95% CI, 82% to 95%), according to a recent meta-analysis of 11 clinical studies (n=264 patients) (8). The efficacy and safety of sofosbuvir-containing regimens in patients with HCV and impaired kidney function has been evaluated in the HCV-Therapeutic Registry and Research Network study, which is a longitudinal, observational study of chronic hepatitis C from academic and community centers (n=1789 patients) (9). A minority of patients (n=73) had kidney impairment (eGFR<45 ml/min per 1.73 m2); patients with eGFR<45 ml/min per 1.73 m2 more commonly experienced anemia, and worsening of kidney function in comparison with those having eGFR>45 ml/min per 1.73 m2. A phase 2 clinical trial on the efficacy and safety of ledipasvir/sofosbuvir in adults with chronic HCV who are on dialysis for ESKD is currently ongoing (ClinicalTrials.gov identifier: NCT03036839). Additional points regarding DAAs administration in advanced CKD include the risk of drug-drug interactions (advanced CKD patients usually take a large number of medications at home), and the possibility of Hepatitis B virus reactivation (as documented by a recent warning from the US Food and Drug Administration) (10). The choice of the optimal timing of DAA treatment in HCV-infected kidney transplant candidates is another question; the eradication of HCV before kidney transplantation may stop the progression of liver disease and reduce the risks associated with viral persistence after transplant (new-onset diabetes mellitus, HCV-associated GN, and transplant glomerulopathy). However, HCV-positive kidneys are currently underutilized and the ongoing injection drug epidemic in the United States is increasing the number of HCV RNA-positive donors available. Transplantation from HCV-positive donors may shorten the waiting time for transplant and studies using DAAs in HCV-infected kidney transplant recipients emphasized the safety of transplantation of HCV-infected kidneys into HCV-positive recipients. The use of HCV-positive grafts in HCV-negative recipients has been favorably addressed in some small clinical trials, but deserves further investigation (11). In conclusion, treatment options for HCV have rapidly evolved over the past 5 years and various treatment choices for patients with advanced CKD are currently available. Patients with CKD have a short life expectancy due to age and comorbidities; future studies will need to clarify the effects of HCV eradication with DAA therapy on outcomes and survival in patients with kidney disease. F.F. is a consultant/advisor to AbbVie and Merck & Co.